2) Be pro-active with your complaints. There are two types of complaints – idle complaints (when we whine and moan about how bad things are) and pro-active complaints (when we take issue with something and pro-actively bring it to the attention of those who can potentially do something about it). A great example of this here in our country is contacting our elected representatives – at the national, state, and local level. Whether we voted for them or not, they work for us. And, picking up the phone, writing a letter, sending an email, or posting on social media directly to one of our elected representatives and letting them know how we feel about something specific is a way we can influence change and be pro-active with our complaints. Sitting around and talking about how awful something is, which we all do and is easy to do, doesn’t usually make things better. But, pro-active complaints can be the catalyst for positive and productive change in many situations. 5) Focus on gratitude. In the midst of challenge and difficulty it’s sometimes hard to focus on gratitude, but it’s also so important for us to do. I recently listened to an interview with Dr. Brene Brown and Sheryl Sandberg in which Brene talked about some research she did with parents who lost children. She said, “the research showed that people who have suffered this intense of a loss want those around them to appreciate what they have…and doing so honors their loss.” Hearing this made me realize that when we see people suffering, one way we can honor and support them best by being grateful for what we have. Being grateful for our lives and our blessings isn’t mutually exclusive for wanting to support and be of service to those who are in need. Even in the midst of challenging times in our own lives and in the world, there is always so much to we can celebrate and appreciate. What can you do to be a force for good right now? 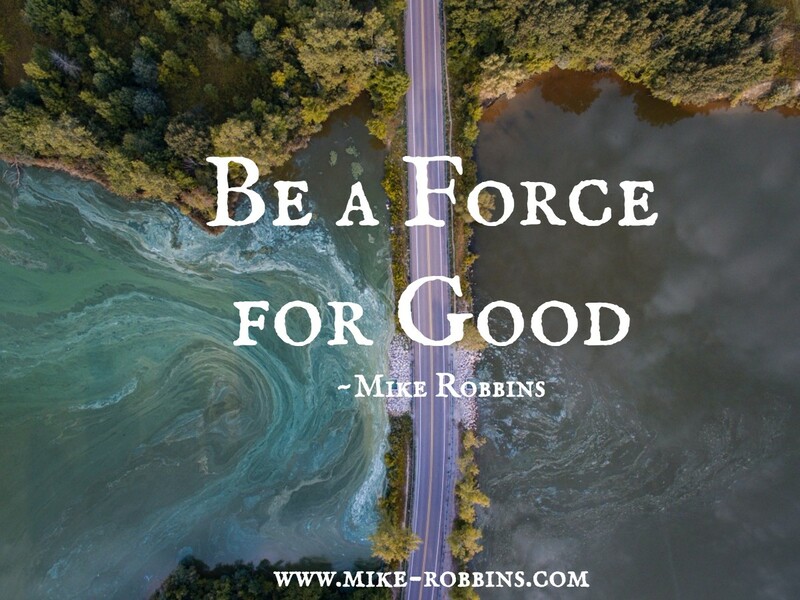 Share your thoughts, feelings, and insights about this here on my blog (https://mike-robbins.com/be-a-force-for-good/).